This week I received some questions from the captains about playing rules. Here are the answers to the questions they asked. 1. Does the infield fly rule apply? There is no "infield fly" rule in the WAKA rules, nor any countermeasure against fielders who find it to their tactical advantage to let a ball drop rather than catch it. 2. What happens with an overthrown ball? - The runner may advance only one base the runner is on or running toward when the ball travels into fouls territory. - An overthrow is a ball thrown, kicked or deflected into foul territory while making an defensive play. - One base on an overthrow is a restriction on the runner not a right to the runner. 3. I think we'd like additional clarity on foul balls. Specifically the details on if a ball goes behind the cones at home plate is that a foul or no? If a ball is kicked behind the cones and does not pass between the front two cones, it is considered a foul ball even though it goes into fair territory. If a kicked ball hits a cone in the kicking box it is usually a foul because of the ball’s trajectory. If the ball hits a front cone and stays fair, it’s a fair ball. If it hits a front cone and stays foul, it is a foul ball. If it hits a back cone at all it is a foul ball. The location of the back cones are marked with stars in the diagram below. 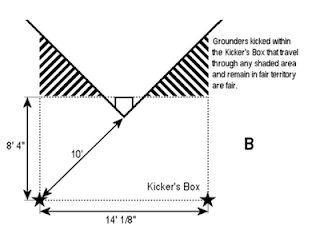 A ball if fair if it passes through the kicking box and/or the marked lines area (in the diagram). 5. When the bases are loaded and a ball is kicked on the ground and hits the runner on any base, is that runner out or considered safe even though that base is no longer safe for them to stand on?